I am, like many of you, BUSY! And like many of you, I have set fitness goals or "resolutions". I wrote an article almost 2 years ago about how to keep a new years resolution and keep it, and in addition to having SMART Goals, daily reminders and progress tracking are great ways to measure and obtain your goals. 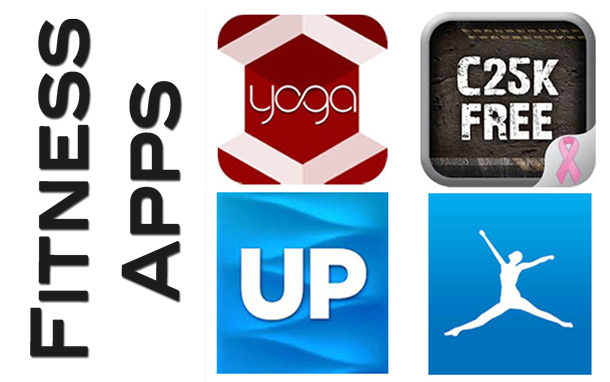 Here are 4 apps that I have been using for 4 weeks or more that are extremely helpful! Yoga, an app called "All-in-one-Yoga" was something I downloaded around July 2013. I downloaded it because I was traveling so much that I was completely stressed and I had some surgery the prior year that prevented me from doing the level of exercise that I really wanted to do. I hate running, I always have, but I know it is good for me. It really kick starts my metabolism and frankly when I've completed running I feel really accomplished. I also like the social aspect of running in 5Ks (and the t-shirts:)). While there are written programs, I know some shoe/sports stores often offer these Couch to 5 K programs, which I've also participated in over 4 years ago (to lose the baby weight), I like this app because I control when I run - I'm on my schedule not someone else's. And because the run takes 30 minutes, I can find 30 minutes in my day to work it in. Why I love the app: It's regimented and displays for you how long you run and how long you walk prior to starting the session with a count down (this helps me mentally prepare myself by saying things like - I can do anything for another minute, or another 45 seconds etc). It has 5 minute warm up, 5 minute cool down and will work with your music or podcasts. As I've mentioned before, I travel and I can take my program any where. What also has helped me stick with the program is the fact that I'm tweeting my accomplishments (optional feature), but it makes me feel a bit more accountable (my husband watches those tweets :) ). 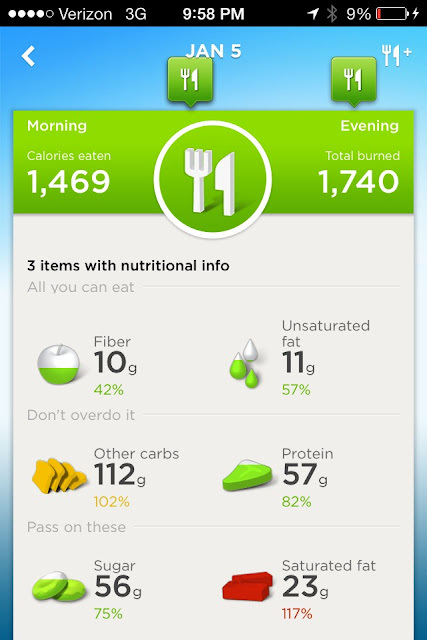 MyFitness Pal app allows you to keep track of what you eat on a daily basis and track your progress against your caloric goals. Why I love the app: It allows me to plan my caloric intake so that if I splurge on lunch I know I need to take it down a notch for dinner and plan better for the dinner meal. For example: I wanted pizza tonight really badly, so I was able to use the app to find how many calories are in Domino's Extravaganza Pizza and plan my lunch and snacks to make sure I could have two slices and then I even had a salad! I also log my workouts with MyFitness pal so that I can see the difference between the caloric intake and the amount that I just exerted. But what I really love is how it interacts with the next app. is a bracelet that I wear almost all the time. I bought the UP by Jawbone because I recognized that I was sitting way too much and the vibration reminder that it gives off signifies for me to get up and do something besides stare at my computer. The UP by Jawbone keeps track of my sleep patterns, how many steps I take, my naps (when I get them) and reminds me when I've been sitting still too long (which with a computer/office job, I do A LOT). Why I love the app: Several years ago I tried the FitBit that snapped to your clothing, it didn't work so well for me because I kept knocking it off in my sleep or would forget to clip it on in the morning. With the Jawbone, it's a piece of jewelry, a neat accessory that stays on at night and throughout the day. When I wash my face or shower I take it off and put it with my ring and earrings. When I'm done, I slip it back on when I add my accessories - you can't forget it! I also love the alarms that it has built in; I can set the alarm through the UP app, synchronize the app with my Jawbone and it will vibrate during the most optimal time within the specified timeframe I set the alarm. I wake up around 5am and I'm not groggy because it finds when I'm sleeping lightly! The power nap feature is also wonderful! I tap the end of the bracelet 3 times and it goes into nap mode, which means I can take a nap and it will wake me up at the optimal time after I'm throughly rested. My naps are power naps that last around 25 minutes and I wake up refreshed! But best of all, the Up app synchs up with MyFitness Pal so that the number of steps, the calories I've taken in and the calories I've burned during exercise are all taken into account. Giving me an overall picture of how I did that day. Here is what the end of January 5th looked like: my goal is to sleep 8 hours a night - almost made that with 85%. My goal is to take at least 10,000 steps a day - almost made that with 93%. And I logged 3 meals in myFitness Pal. 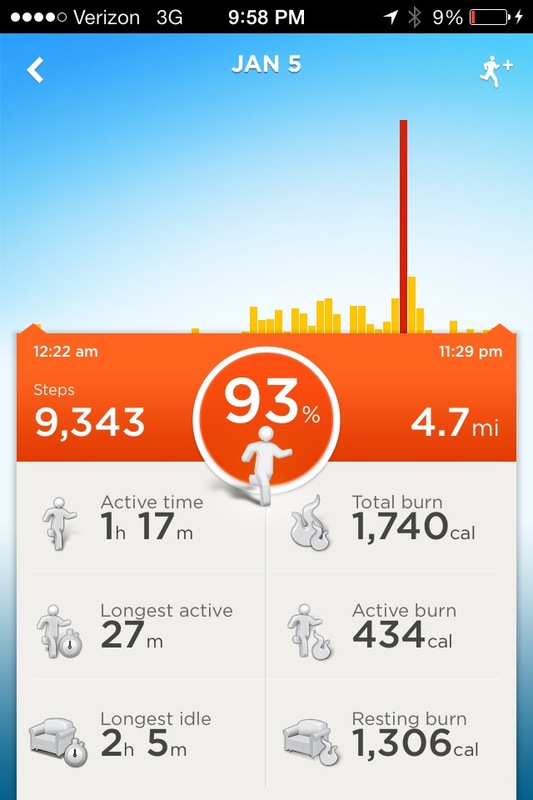 When I clicked on the Orange bar, I can see a total steps taken for the day, where I got the most activity and the longest I was idle, meaning I didn't get up! But, the value is, around 5pm I synched up the Jawbone with the UP app and saw that I was around 50% of my goal, soI went to the gym around 7pm (after the kids had their bath) that way at least I wouldn't be such a lazy blob. When I click on the green bar I see what I entered into myFitness Pal combined with the Up app - I ate 1469 calories but burned 1740. - cool! I was heavy on the saturated fat (sausage and eggs will do that). But overall, while I didn't meet the sleep and steps goals, I burned more calories than I consumed which is exactly what I want for weight loss! The power of this information allows me to better control what I eat, and adjust where necessary. I can tell you that since I've been using all 4 apps my stress level has decreased, I feel better and at the end of each day I feel accomplished. And even on those days where I go overboard on eating I still have numbers to look at and say - it's not that bad, I can make that up tomorrow. Knowledge is power. 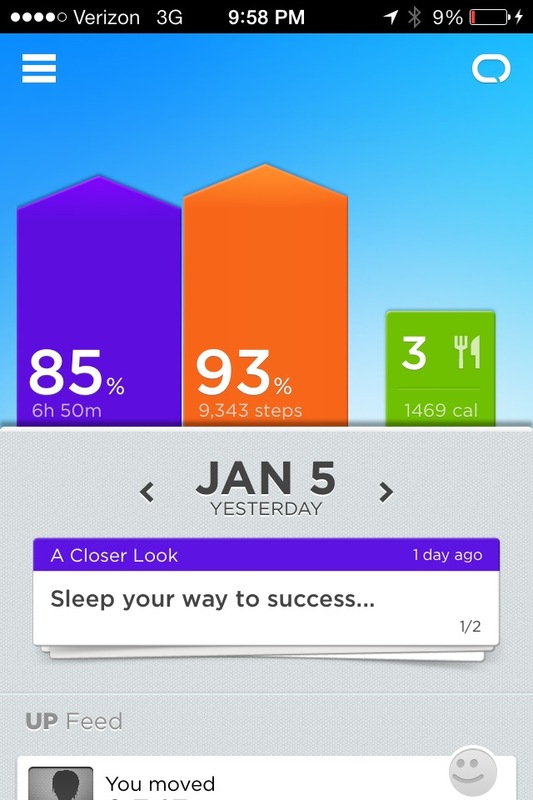 What fitness apps do you like to help keep track of your goals or motivate you?